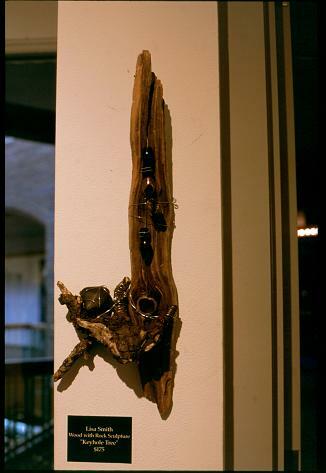 Home Page . . . . . .
Zeodrift Sculptures are original, one-of-a-kind, sculptures made using driftwood, wire, rocks and jewelry. I create "bugs" and larger pieces to hang on the wall, to hold your papers down on your desk, or to be kept as sculptures to entertain you. I love to see people smile as they see and touch my sculptures for the first time. I can make custom sculptures using things that have meaning to you. Incorporating jewelry, fabric, old watches, almost anything into an original sculpture for you to hang on your wall or display on a table or shelf. I leave the materials I find in their original state. I do not cut the wood or polish the stones, I leave them as nature intended them to look. They have been sculpted by Lake Superior. 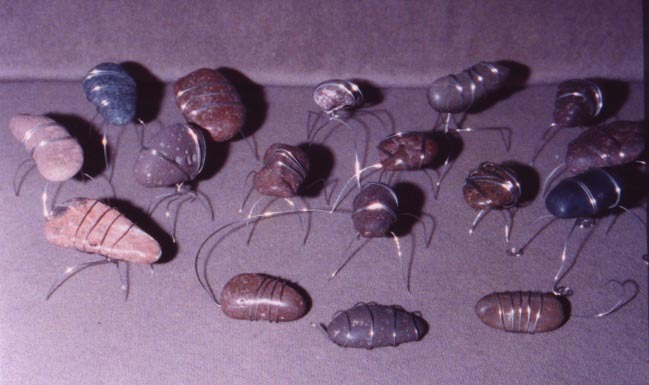 I put them into a new form using wire and jewelry and beads to bring out their "personalities". the 2002 Minnesota Pride Art Show, the 2003 BECAUSE Regional Conference Art Show, and at the 2003 Minnesota Pride Art Show. or if you wish to purchase any pieces. which is my music site.